You can use that salted butter! 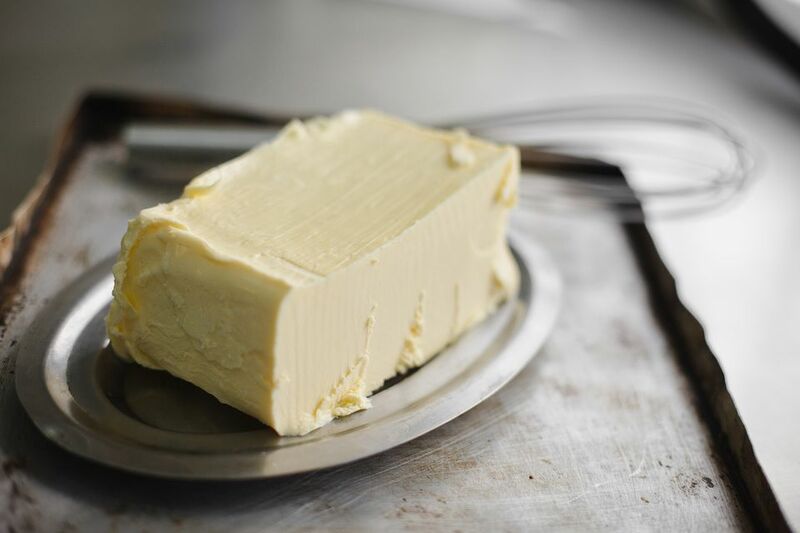 Many baked good recipes call for unsalted butter, but if you don't have any on hand, you can use salted butter in its place, with only slight modifications to the recipe. This is great news when you don't want to run to the store for just one ingredient! Trying to tweak a recipe to make it dairy-free, vegan, or lower in fat, there are additional unsalted butter substitutes that you can try, although keep in mind, it will change the recipe a bit. Here's what you need to know to get the substitution right. Just replace the unsalted butter called for in your recipe with an equal amount of salted butter. Then, adjust the amount of salt in the recipe to account for the extra salt in the butter. To do this, simply reduce the salt called for in the recipe by 1/4 teaspoon for every stick (1/2 cup) of butter used. One caveat to this substitution is that different brands of butter contain different amounts of salt—a single stick of butter could have anywhere from 1/8 teaspoon to 1/2 teaspoon of salt. But don't sweat the difference. Just give your recipe a quick taste, and make any necessary tweaks. In most cases, having a little more or less salt in a dish won't make a bit of difference. Because when you get right down to it, an extra 1/8 teaspoon of salt isn't much when you divide it among all of the servings in a recipe. Since the amount of salt varies from one brand of butter to the next, many bakers develop their recipes with unsalted butter, adding the salt as a separate, measured ingredient. This gives the baker precise control over how much salt is included, so the recipe delivers reliable results that are easy for others to replicate. In general, recipes don't call for unsalted butter to decrease the amount of sodium in your diet, but this can be another reason for unsalted butter to be specified in a recipe, particularly if you're working on a recipe that you found in a health-focused magazine or blog. If you don't bake or cook often, consider keeping unsalted butter in your freezer. You won't have to worry about it going bad, and you can thaw it out as you need it. To use butter straight out of the freezer, just microwave it in 10 second intervals, until it's soft. Vegetable shortening—Replace the butter measure for measure. For baking, this would be preferred, as it's likely to best preserve the consistency of the finished product. Vegetable oil—Use 7/8 cup of vegetable oil for each cup of unsalted butter called for. This is not a good choice for baking, since it will change the consistency of the baked goods considerably. Lard (animal product)—Use 7/8 cup of lard for each cup of unsalted butter called for. This substitute is suitable for both baked and cooked dishes. If you're trying to reduce the fat (or saturated fat) in a baked good recipe, you can substitute half of the unsalted butter called for with avocado, applesauce, or full-fat Greek yogurt. Just know that your baked goods are likely to come out denser and moister than intended. Give it a try in a few recipes, and you may just decide that that's a good thing.